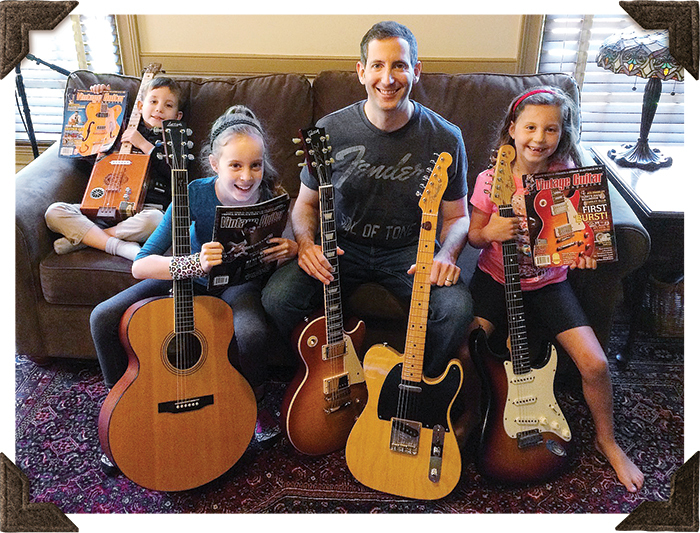 Jim Brennan and his kids, Michael, Anna, and Olivia, sat with the family’s cigar-box guitar, ’99 Larrivee Jumbo, ’16 Gibson Les Paul Traditional, reissue Fender Tele, an ’02 Strat, and copies of their favorite magazine. 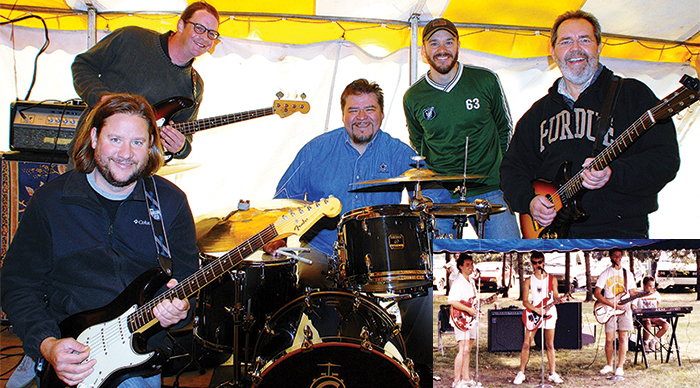 Mark Smith and his sons, Jason, Jeremy, and Nathan have been jamming for 30 years as the Generation Gap Band. Jason’s playing a ’64 Strat, Mark has a ’63 Melody Maker, and Nathan is standing. Their helper friends include Brandon on bass and Sonny on drums. “Jeremy still joins us when he is in town,” Mark said. In 1988, Mark played a ’67 Gibson Trini Lopez Standard, Jason an ’86 Charvel Model 3, Jeremy a ’63 Fender Jazz, and that’s Nathan on keys. 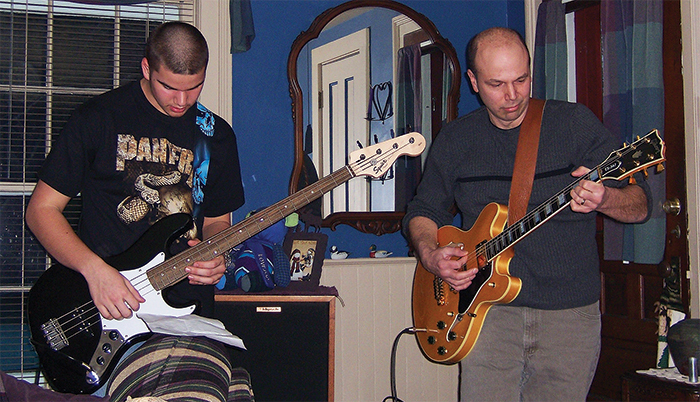 Dan Hedt sent this shot of he and his dad during their first jam. “Dad was playing a Sherwood, made by Kay in Chicago, and this was around 1954,” he said. 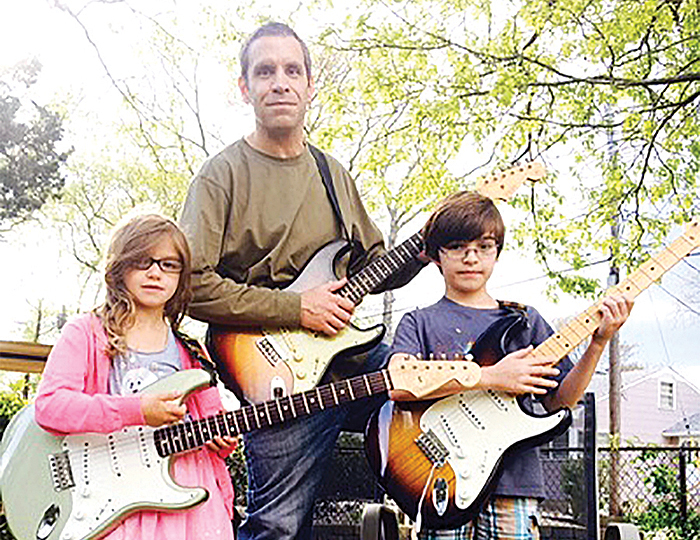 Chris Gojdics enjoys quality time with his six-year-old daughter, Sophia, and nine-year-old son, Nicholas, rocking out on their Strats – a Robert Cray Custom Shop, a 1960 in sunburst, and 50th anniversary model. 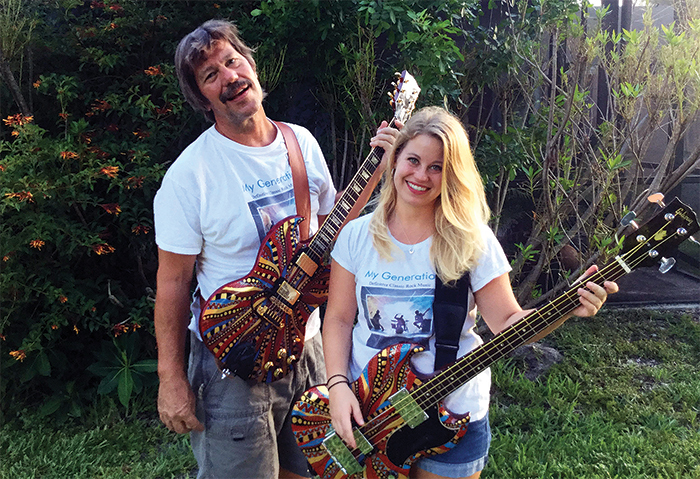 Jeff Abbey and his daughter, Jillian, perform as My Generation Band in their home town of Boca Raton, Florida. “We play twin custom-painted Gibsons from the ’60s – an SG and EBO, doing music from my generation up to the current trends of her generation,” said Jeff. 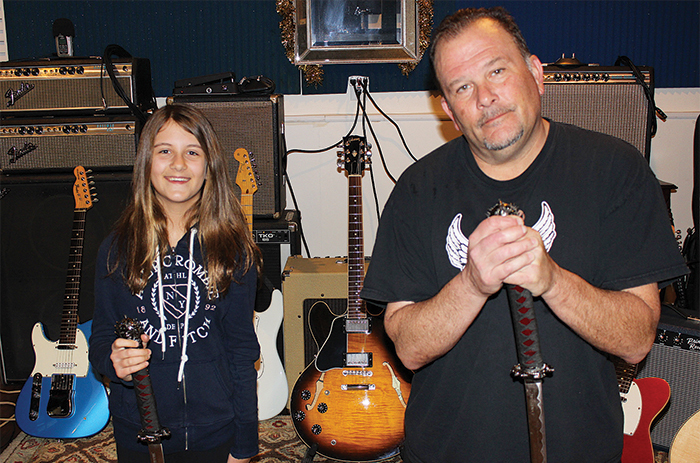 Check out Brian Less with his 12-year-old twins, Sammi and Jordan. 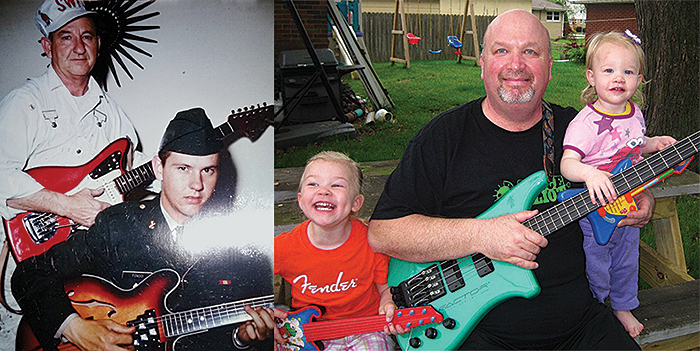 Sammi is holding a ’65 Mustang refinished in Sea Foam Green while Jordan is holding an anniversary Precision Bass. Dad has his ’90s American Standard Tele. In the background is a pawn-shop-find Teisco. 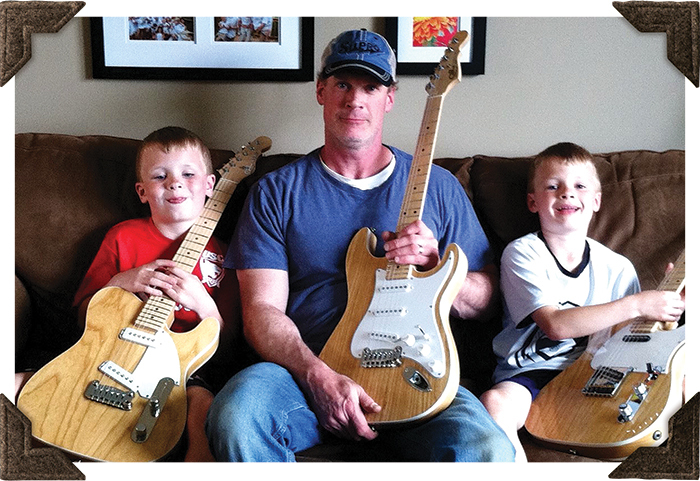 Jim Holtschlag sat with sons Matthew (8, left) and Luke (6) and their custom G&L guitars, ordered the day each were born. “Guitars make great heirlooms!” said Jim. 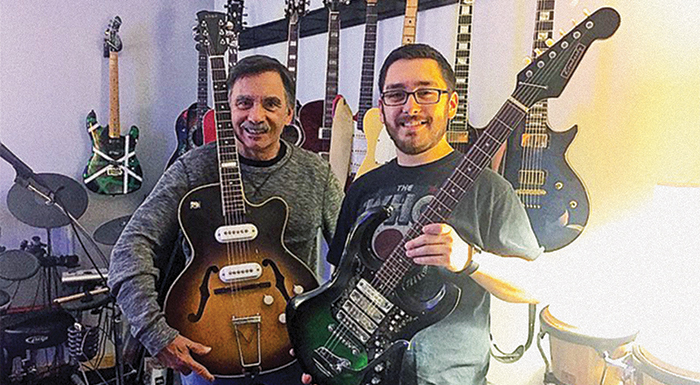 Art Martinez loves to jam with his twin sons. Here, Art (middle) has his Gretsch Power Jet Firebird while Blake (left) has a Tobias Burlwood five-string bass and Taylor is using a Fender American Standard Strat. 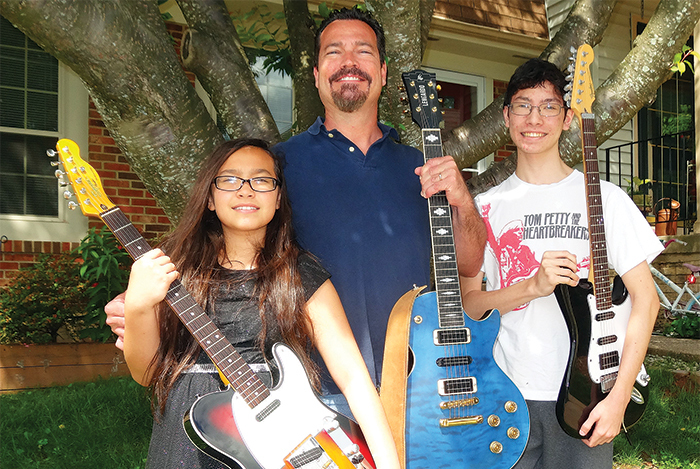 Dominic Harris and his kids, Keith and Holly, fill the house with music. 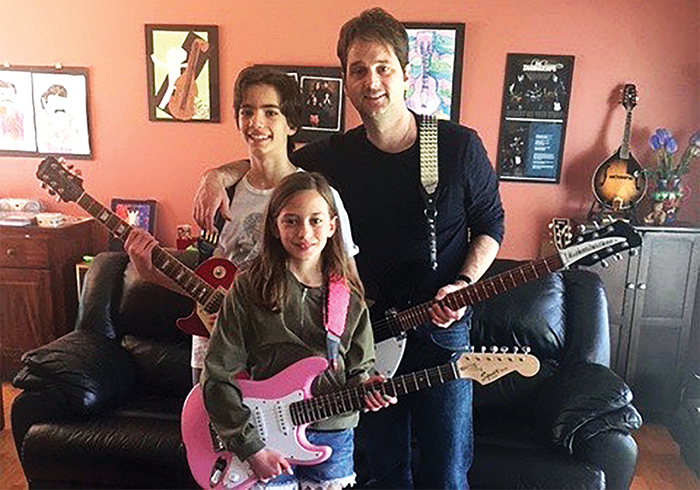 Dominic has his new Rickenbacker 330, while Keith has his Epiphone Les Paul and Holly rocks her pink Squier Strat. Bob Phelps did this “Dad’s Day” two-fer by including an archival pic of his father-in-law and brother-in-law, taken in the mid ’60s. Jerry, in uniform, still owns the ’65 L-plate Jaguar. “We’re not sure of the make or model of the hollowbody, but he had it while stationed at Fort Hood.” Then, Bob sat with his Kubicki Factor (in Bahama Green) joined by granddaughters Claire on guitar and Hope on vocals. 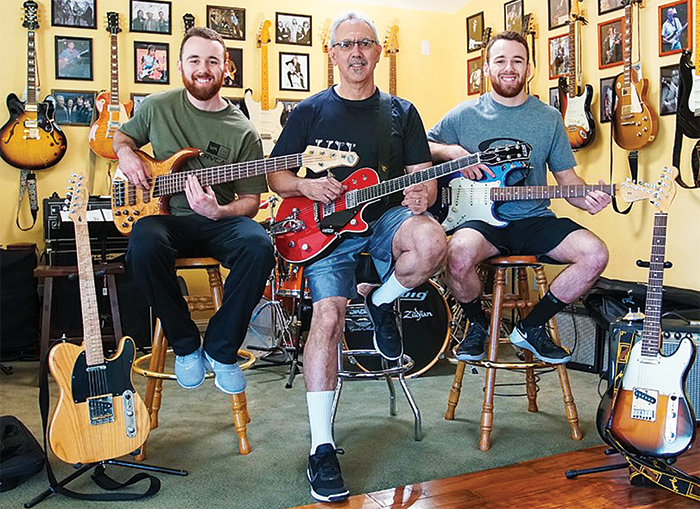 Kevin Hauze and his son, Kerry, are proud of their working-man’s treasures collected over 41 years of what Kevin calls “geetar adoration.” From left they are a ’97 Clapton Strat, a Cunetto, an ’80s Tele, an ’04 Custom Shop Les Paul Custom reissue, an Epiphone Casino, ’59 Gretsch Duo Jet, ’35 Dobro, ’34 National Style O, a ’46 Martin 00-17, and a ’20s Kay-Voisinet. Kevin is holding his 1920 Dyer Style 7 harp guitar while Kerry has a 1919 Stetson, made by the Larson Brothers. 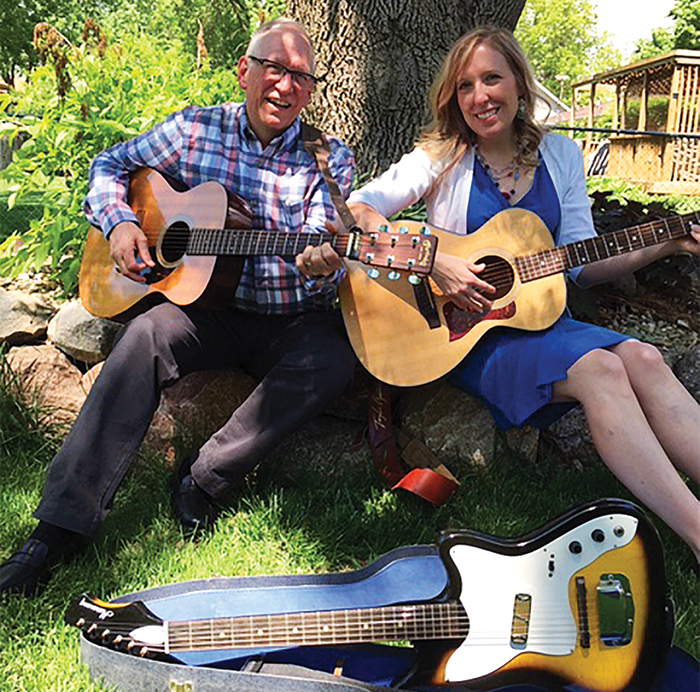 Rick Cox and daughter, Stacy, like to play worship music and acoustic rock on his 2000 Martin OM-21 and her ’93 Taylor 412. The ’60s Harmony Bobcat H14 is a recent addition to Rick’s collection. 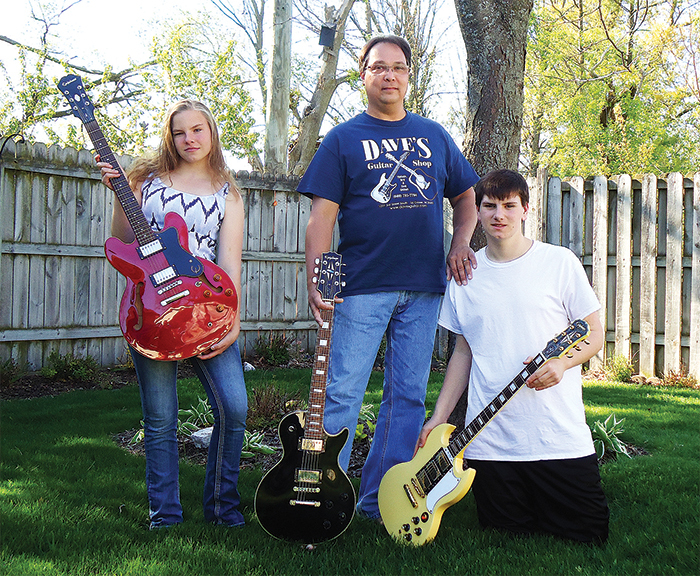 Paul Arntson and sons Zak, Jake, and Luke all play guitar. “And we’re working on the grandkids!” said Paul. 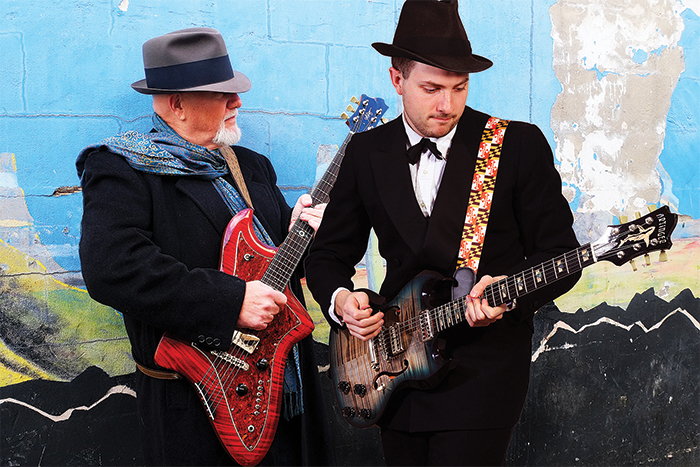 Michael G. Stewart (left) and his son, Spencer, rock out on a couple of Matt Artinger custom guitars they call Tokyo Rosie and The Shark. Here are Chris Cassone with his Les Paul Standard 100th Birthday Edition and dad, Paul, with his modded ’67 Tele, which he has enjoyed since ’73. 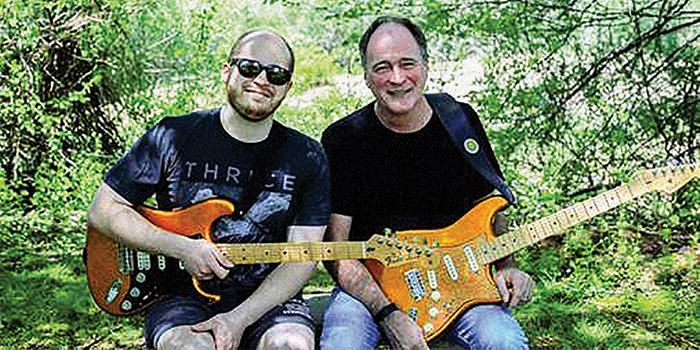 Dan Zampino and his dad, Mark, grabbed their matching Fender Stratocasters in special-run Orange Flake. 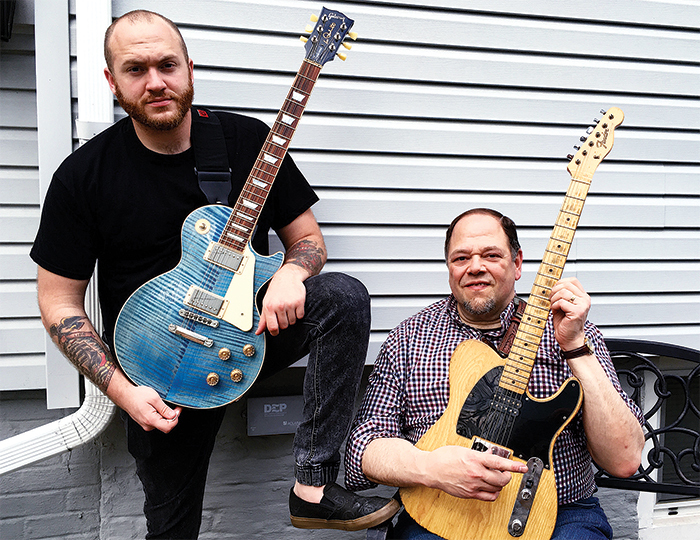 Dan dressed his with a black pickguard, while Mark installed Jeff Beck Noiseless pickups, an LR Baggs piezo, custom pickguard, and a Deluxe Strat neck. 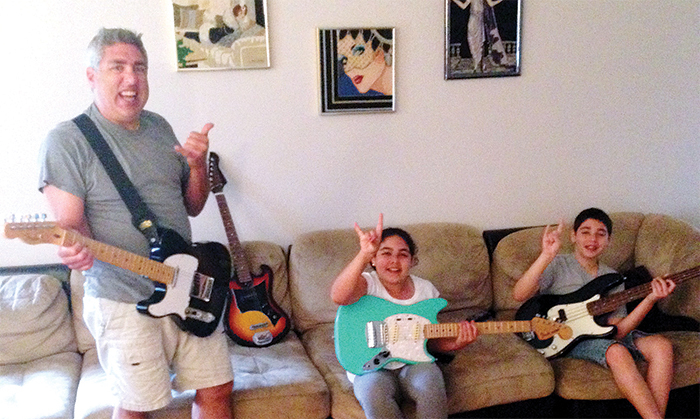 When the Roth kids, Viviana (12) and Vin (15), get put in “time out” they know it’s time to rock out with dad! 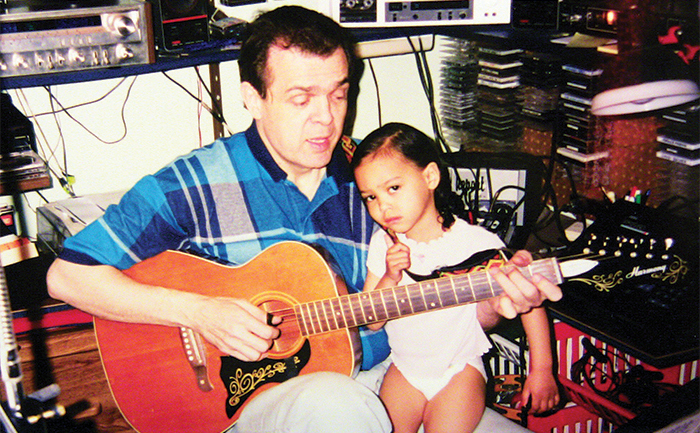 Here, Vin has a ’92 Strat Plus, Viviana a Squier Tele. Dad Vinny mostly uses his Lengardo Milano JBE. Here are the Ross boys from Mississippi. 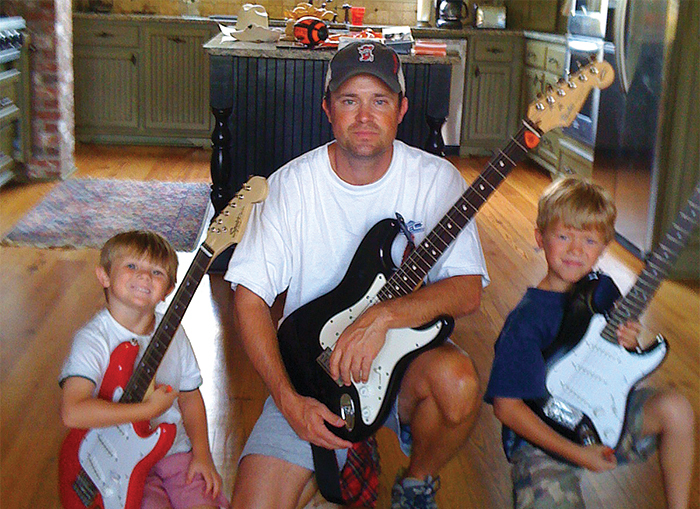 Alex is set with his 40th Anniversary Strat (from ’94) while sons Alston (left) and Van wield their Squier Mini Strats. 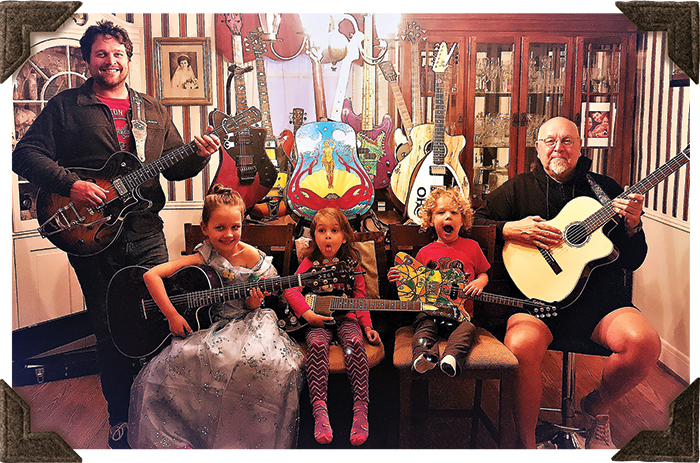 Matthew Graboski gathered his children, Delilah, Cecilia, and Jasper Stone, along with his dad, Jay, to sit for this pic with their stringed things. 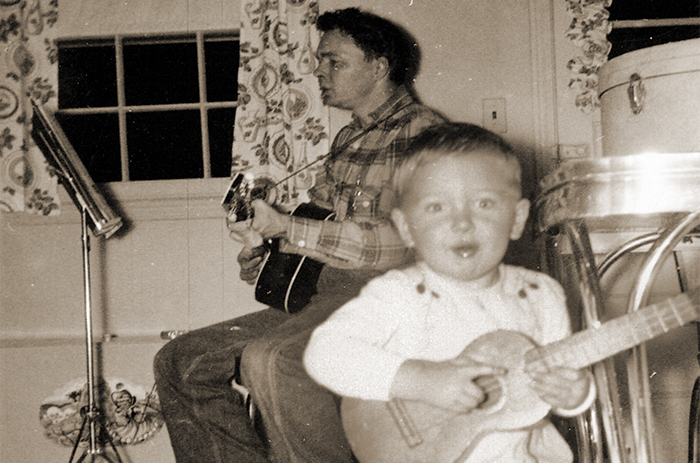 Here are Jim Balzarini with ’50s Vega and son, Mike with a Kimberly Bison from the ’60s. 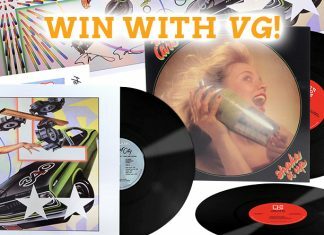 “Between us, we have 25 guitars,” said Jim, who’s been a VG reader since 1993. 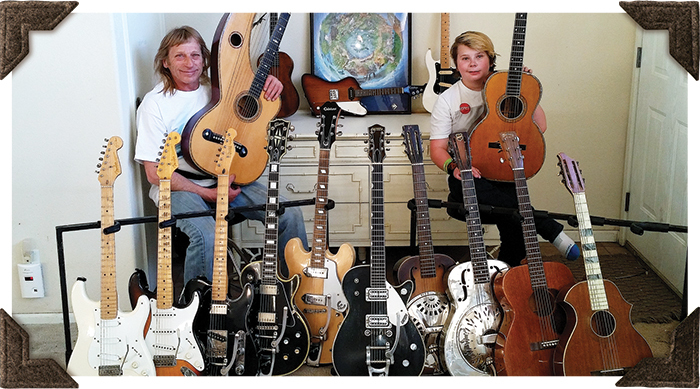 Kalin, Dale, and Reece Colberg with their collection of Epiphones. 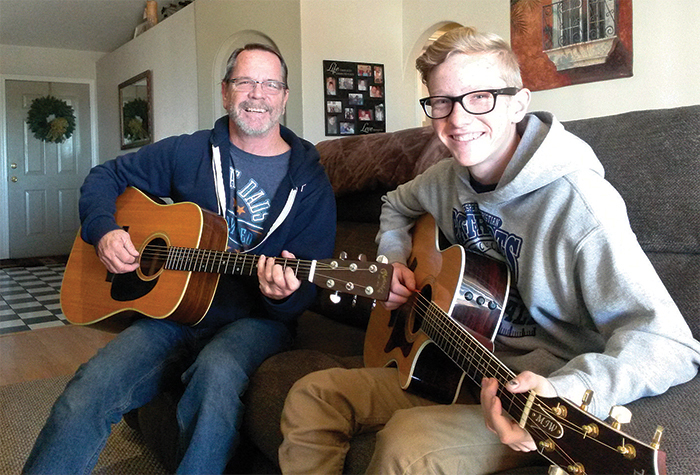 Patrick Wilberding and his grandson, Zachary, run through a few licks that Patrick once taught Zachary’s late father on the same ’73 Martin D-28 and Taylor 814 CE. Steve Alvito with his ’79 Gibson ES-347 and son, Cody, jamming on Cody’s birthday, with his new Squire Jazz Bass. This article originally appeared in VG August 2017 issue. All copyrights are by the author and Vintage Guitar magazine. Unauthorized replication or use is strictly prohibited.